Vehicle tyres are not only made of rubber. They are a complex blend of many materials and chemicals, including different types of plastic. Kilometre after kilometre, tyres gradually shed tiny bits of material when they interact with the road surface, leading to fine particle emission into the air, but also microplastics pollution of surface waters due to road run-off. Microplastics from tyres include a number of chemicals, some of which carcinogen, mutagens and endocrine disruptors, which can easily leach into the environment. Small plastic particles from tyre wear can also enter wildlife and human bodies through ingestion and inhalation and have been associated with considerable negative health impacts. Following the usual procedure, Member States and the Parliament are now discussing the proposal. Unfortunately, most Member States seem ready to put a curb on the Commission’s enthusiasm and delay the decision for about 10 years. And despite their apparent will to fight plastic pollution, MEPs look like they want to weaken the Commission’s proposal too. The current text now misses concrete dates for the inclusion of abrasion into the label. A vote will take place on 25 March which will set the Parliament position and the fate of the much-needed addition to the label. If Europe is serious about solving the plastics issue, it needs to both tackle visible and invisible plastics pollution. 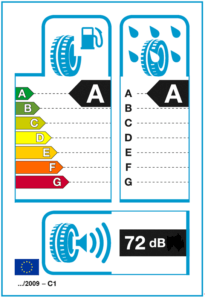 Establishing a measurement method and adding an icon on the tyre label is part of the solution. And unfortunately, the Commission won’t be able to do it alone. If the institutions fail, tyres will remain the main source of unintentional microplastics emissions into the environment. Update from the European Plenary vote on 26 March 2019: As feared, despite their will to fight plastics pollution, the European Parliament has decided to postpone this action for years. By Ioana Popescu & Chloé Fayole, ECOS. This article has been produced by ECOS, in the context of the Rethink Plastics alliance and Coolproducts campaign.